Systemic lupus erythematosus, or lupus, is one of the most intriguing diseases due to its diverse clinical picture, variable course and in the single patient also its unpredictable outcome. The etiopathogenesis of lupus has been studied intensively for many years and the disease has long been regarded as the prototype autoimmune disease. The reason for this is that a large number of different autoantibodies are produced in lupus patients and that most, if not all, cells in the immune system seem to be involved in the disease process. The most prominent feature in lupus is an immune response to nucleic acid and associated proteins, which results in autoantibody production, immune complex (IC) formation and organ inflammation. In addition, most lupus patients display several signs of an increased IFNα production, which during the past years has attracted much interest regarding the possible role of this cytokine in the disease process. This interest has been further inspired by the observation that IFNα administration to individuals without any autoimmune condition can trigger the production of antinuclear autoantibodies, and occasionally also a lupus syndrome. In the present review, the possible reason(s) behind the ongoing IFNα production in lupus will be reviewed, as well as the role of IFNα in the etiopathogenesis and the clinical manifestations of the disease. The potential application in clinical practice of our present knowledge of the type I interferon system in lupus will also be discussed. The first described cytokine abnormality in lupus patients was an increased serum level of interferon , which subsequently was characterized as IFNα . Early studies also demonstrated that lupus patients have increased levels of IFNα-induced proteins, such as 2',5'-adenylate synthetase  and MxA . The latter report showed that >90% of lupus patients displayed increased expression of MxA, even if measurable serum IFNα levels could not be detected. Further studies showed that serum IFNα levels correlated to disease activity, but also to signs of immune activation and several clinical disease manifestations . Functional analysis of type I interferon activity in serum from lupus patients has revealed that there is an association between serum interferon activity and immuno logical phenotype . When genome-wide gene expression profiling became available, several research groups observed that a large proportion of lupus patients have an increased expression of type I interferon-regulated genes (an interferon signature) in peripheral blood mononuclear cells [7–10], but also in affected organs such as the kidneys . The interferon signature was observed in almost all pediatric lupus patients with active disease of recent onset ; in adults with more longlasting and less active disease, in comparison, approximately one-half of the patients displayed the interferon signature [8, 9]. The natural interferon-producing cell, also termed the plasmacytoid dendritic cell (pDC), has the unique capacity to secrete up to 109 IFNα molecules per cell in response to viral infections . These cells appear to be the major type I interferon-producing cell for many different interferon inducers, including both viruses and bacteria. The prominent signs of an ongoing IFNα production in lupus therefore raise questions of the natural interferon-producing cell/pDC function and the potential IFNα inducers in these patients. Several studies have shown that the frequency of circulating pDCs is markedly reduced in lupus patients [13–15], although residual single cells upon stimulation have a normal IFNα-producing capacity. The reason for the decreased number of circulating pDCs seems to be a migration of these cells to tissues, because an increased number of pDCs can readily be detected in the skin [16, 17], in lymph nodes  and in renal tissue  from lupus patients. pDCs are furthermore activated in vivo and synthesize IFNα, which indicates that these cells are responsible for the continuous IFNα production in lupus. The pDCs can be activated to IFNα production via triggering of Toll-like receptor (TLR) 7 or TLR9, which sense single-stranded RNA and CpG-containing DNA, respectively (reviewed in ). These receptors are localized in the endosome to prevent activation by self RNA or DNA. Ligation of the TLRs leads to interaction with the myeloid differentiation factor 88 adaptor protein and subsequent phosphorylation of several transcription factors, among which interferon regulatory factor (IRF) 5 and IRF7 are most important. In addition, the TLR9-mediated induction of type I interferon production requires an intact mammalian target of rapamycin pathway . In the search for an endogenous IFNα inducer in lupus, we noted that sera from such patients contain ICs consisting of autoantibodies and DNA with the capacity to specifically activate pDCs [22, 23]. Further studies revealed that such interferogenic ICs are internalized via the FcγRIIa expressed on pDCs , reach the endosome and stimulate the relevant TLR with subsequent activation of transcription factors and IFNα production . This mechanism for induction of type I interferon production has been demonstrated in vitro for both DNA-containing and RNA-containing ICs. The nucleic-acid-containing autoantigens in the interferogenic ICs can be generated from apoptotic or necrotic cells , which is relevant given the increased apoptosis and reduced clearance of apoptotic cells in lupus . Several molecules are involved in the IFNα response to these ICs. The high-mobility group box 1 protein/receptor for advanced glycation end-products interaction is necessary for the TLR9-induced IFNα production by DNA-containing ICs , whereas C1q decreases the IFNα production by interferogenic ICs . There exist several different ICs with the capacity to activate pDCs, but RNA-containing ICs that trigger TLR7 seem to be especially potent as IFNα inducers [30, 31]. There is also a correlation in lupus patients between serum IFNα activity and the presence of autoantibodies to RNA binding proteins . Such autoantibodies appear very early in the development of the disease, usually several years before the appearance of clinical overt lupus disease . Since some of these autoantibodies show cross-reactivity with viral epitopes, the initial trigger for the production of antibodies with IFNα inducting capacity could well be a viral infection . This scenario would connect viral infections with the generation of interferogenic ICs, with the capacity to create a self-perpetuating vicious circle driven by IFNα  (see Figure 1). Role of the type I interferon system in the etiopathogenesis of lupus. 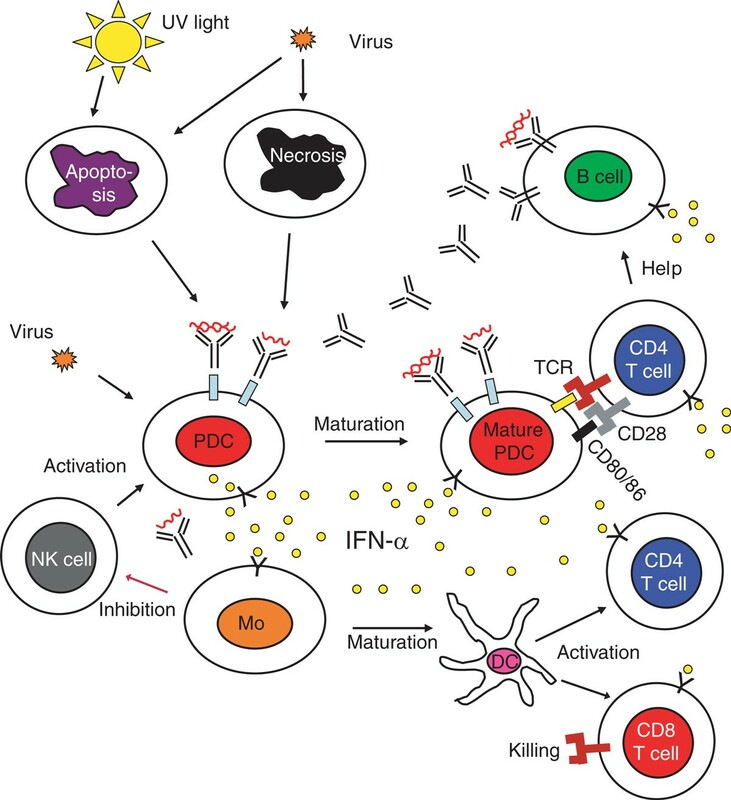 A viral infection induces IFNα production in plasmacytoid dendritic cells (pDCs) and the release of autoantigens from dying cells. Produced IFNα promotes maturation of monocytes to dendritic cells, activation of T cells and stimulation of B cells, as described in the text. In individuals with a genetic set-up that causes a strong IFNα production and/or a marked IFNα response, tolerance is broken and antibodies against nucleic-acid-containing autoantigens are produced. The autoantibodies, together with the autoantigens, form interferogenic immune complexes (ICs) that act as endogenous inducers of IFNα production in pDCs. In addition, these ICs can directly stimulate the B cells to increased autoantibody production. UV-light induced apoptosis will increase the release of autoantigens, which will result in the formation of more interferogenic ICs. All these events will establish a vicious circle with an ongoing production of IFNα by the pDCs and a continuous exposure of the immune system to IFNα that maintains the autoimmune process. Natural killer (NK) cells promote the IFNα production, and activated monocytes downregulate the NK cells, but the monocyte function seems to be deficient in lupus. Figure modified from . DC, dendritic cell; Mo, monocyte; TCR, T-cell receptor. One obvious question is whether certain individuals have an enhanced IFNα production or sensitivity, which could increase the risk to develop lupus if nucleic-acid-containing ICs appear. The observation that a high serum IFNα activity seems to be a heritable risk factor for lupus  indicates that the genetic control of the type I interferon system is important for the risk to develop this disease (for a comprehensive review, see article S3 in this supplement). The transcription factor IRF5, which is constitutively expressed in pDCs , was the first identified gene directly involved in IFNα production that was associated with increased risk for lupus . The allele variants with the highest probability of being causal were identified recently, and were shown to affect the IRF5 expression, which is increased in peripheral blood mononuclear cells from lupus patients . An IRF5 risk haplotype is associated with a high serum IFNα activity in patients, and especially in those with autoantibodies to RNA binding proteins or double-stranded DNA , linking lupus genetic susceptibility to the presence of interferogenic ICs. The IL-1 receptor-associated kinase, which is involved in TLR signaling and IFNα production, is also associated with lupus , which further strengthens the view that the genetic control of the IFNα production is important for the risk to develop lupus. The importance of the TLR pathways in this disease is further underscored by the observations that gene variants of the TNFα-induced protein 3 is associated with increased risk for lupus [41, 42]. Among genes involved in the response to IFNα, the signal transducer and activator of transcription 4 (STAT4) that interacts with the cytoplasmic part of the type I interferon receptor (IFNAR)  is strongly associated with lupus . In lupus patients there is an association between the STAT4 genotype, increased sensitivity to IFNα  and a more severe phenotype, which includes nephritis and the presence of anti-double-stranded DNA autoantibodies [46, 47]. Polymorphisms in the Janus kinase tyrosine kinase 2, which binds to the IFNAR and is required for signaling through this receptor, is also associated with lupus [37, 48]. These data provide further evidence for a link between the IFNα response and the disease process in lupus. Additional susceptibility genes for lupus can be involved in the activation of the type I interferon system by other mechanisms - for instance, via increased production of autoantibodies and subsequent generation of more interferogenic ICs . What are the consequences of the ongoing IFNα synthesis in lupus patients? Produced IFNα will affect most cells in the immune system and can therefore stimulate the central autoimmune process, but IFNα will also contribute to the expression of some clinical signs and symptoms. The possible role of IFNα as an inducer of lupus was originally suggested by the observation that the administration of IFNα to a patient with a malignant disease induced a lupus syndrome indistinguishable from naturally occurring lupus . During the years, many reports have described the induction of several different autoimmune diseases during prolonged treatment of patients with IFNα . The presence of autoantibodies in patient sera before the onset of IFNα therapy considerably increases the risk for development of clinical overt autoimmune disease during IFNα administration . These observations demonstrate that IFNα has the capacity to both break the tolerance and enhance a smoldering autoimmune process. The mechanisms behind the pro-autoimmune effects of IFNα are not clear, but there exist several possibilities. First, IFNα can induce increased expression of autoantigens, such as Ro52 [7, 8], but can also promote the release of autoantigens by induction of apoptosis . Secondly, IFNα has multiple effects in both the innate and adaptive immune systems, which best can be described as a general activation of the immune cells. IFNα thus induces dendritic cell maturation and activation, with increased expression of MHC class I and II molecules, chemokines and chemokine receptors, costimulatory molecules such as CD80, CD86, the B-lymphocyte stimulator and a proliferation-inducing ligand . Importantly, IFNα can also induce the expression of TLR7 , which may enhance the responsive ness to interferogenic ICs. The development of helper T cells along the T-helper type 1 pathway is promoted, and cytotoxic T cells are stimulated by type I interferons, due to an increase in dendritic cell cross-presentation, inhibition of T-cell apoptosis as well as stimulation of IL-2 secretion by central memory T cells . Type I interferons cause B-cell activation, differentiation, antibody production and immunoglobulin isotype class switching [57, 58], but can also decrease the selectivity of B cells for CpG-rich DNA and allow stimulation by even non-CpG DNA  - thereby promoting an autoimmune response. Consequently, several IFNα-mediated effects can contribute to the autoimmune process in the pathogenesis of lupus. Figure 1 shows a schematic view of the possible role of IFNα in the disease process. IFNα production is affected by several cytokines and cells in the immune system. TNFα and IL-10 can downregulate the IC-mediated IFNα production , and TNFα also inhibits the generation of pDCs . The IFNα response is furthermore regulated by several cells in the immune system, such as natural killer cells and monocytes. Natural killer cells promote the IFNα production whereas the monocytes downregulate the type I IFNα response, and this control mechanism may be deficient in lupus patients . The complex interaction between the different cytokines and the immune system in lupus patients may be further clarified by a network-based analysis of abnormally regulated genes in these patients . Several observations suggest that IFNα may have an important role in some of the clinical manifestations in lupus patients. There is an association between increased serum levels of IFNα and fever, skin rash and leucopenia , which perhaps is not surprising considering these symptoms are commonly seen during viral infections. Among the more specific lupus manifestations, an early study observed that patients with lupus psychosis have detectable levels of IFNα in the cerebrospinal fluid , which is intriguing given the observed neuropsychiatric adverse effects during IFNα treatment . Recently, auto antibodies with the ability to form very potent interferogenic ICs together with RNA-containing autoantigens were demonstrated in the cerebrospinal fluid of lupus patients with neuropsychiatric manifestations . These ICs also induced other chemokines and proinflammatory cytokines of possible relevance for the central nervous system manifestations frequently seen in lupus, which indicates that the interferogenic ICs may be directly involved in central nervous system lupus. Results from an experimental model suggest that IFNα can drive the nephritis and end organ damage in lupus , and it has been shown that pDCs accumulate in active human lupus nephritis . These observations are in line with the findings that major organ involvement in lupus patients, including nephritis, is connected to a more pronounced IFNα signature  and that IFNα-regulated genes are overexpressed in the glomeruli from lupus nephritis . The role of IFNα in the premature atherosclerosis typically seen in lupus patients is unclear, but IFNα may contribute to the atherosclerotic process by impairing endothelial cell differentiation . Furthermore, pDCs are present in atherosclerotic plaques from carotid lesions where, via produced IFNα, they can act as inflammatory amplifiers and destabilize the plaque . We are at the beginning of an era were the basic knowledge of the type I interferon system in lupus is translated into clinical useful tools for monitoring and treating patients. There is a correlation between the serum levels of IFNα and disease activity in lupus patients, as mentioned above. Owing to difficulties in measuring IFNα in serum, however, most investigators study the interferon signature as a potential biomarker. A more pronounced interferon signature is seen in patients with active disease and major disease manifestations, such as nephritis, cerebritis, hematological manifestations and increased damage index [7, 8, 70–72]. Administration of high doses of corticosteroids to lupus patients with active disease, which induces clinical remission, will normalize the interferon signature . These observations have demonstrated a connection between the IFNα signature and the clinical status of the patients. Whether determination of the interferon-induced gene expression can be used to closely monitor the disease activity in single patients during longitudinal follow-up is uncertain, however, because the interferon signature seems to remain stable in the patients despite changes in disease activity [72, 73]. On the other hand, two preliminary reports have suggested that the interferon-gene profile of peripheral blood cells could predict future disease activity [74, 75]. At the moment, the clinical value of monitoring the IFNα signature during long-term follow-up remains to be established. Two other approaches to follow disease activity are either to look at expression of type I interferon-regulated molecules on cells involved in the disease process, such as Siglec-1 on monocytes , or to measure the level of interferon-regulated chemokines . Interestingly, the interferon-regulated chemokines may also be connected to organ damage . There is also a possibility that genes within the type I interferon signaling pathway can be used as biomarkers for organ involvement and severity. There is thus an association between the STAT4 genotype and risk for a more severe disease phenotype that includes nephritis [46, 47] and stroke . The latter observation is interesting, because the association between a STAT4 risk variant and stroke was of the same magnitude as the association between stroke and hypertension, indicating that autoimmune processes may be very important for many disease manifestations in lupus, even those that traditionally not are regarded as autoimmune. Furthermore, a combination of risk alleles within the type I interferon signaling pathway dramatically increases the risk for lupus , which illustrates how genetic mapping in the future perhaps could aid in the prediction of risk for disease. Because many observations indicate a crucial role for the type I interferon system and IFNα in the etiology and pathogenesis of human lupus, several companies are developing therapies aiming to inhibit the type I interferon production or effects in the disease. This development has been stimulated by the fact that type I IFNAR-knockout murine lupus models have a reduced disease activity [80, 81]. Results from the first phase I clinical trial using a single injection of anti-IFNα monoclonal antibodies in lupus patients were recently reported [82, 83]. The anti-IFNα treatment caused a dose-dependent inhibition of the type I interferon inducible genes in both peripheral blood and skin biopsies, as well a reduction in clinical disease activity. In addition, granulocyte-macrophage colony-stimulating factor, TNFα, IL-10 and IL-1β inducible gene signatures, as well as B-cell activating factor mRNA expression, were neutralized in some patients  - demonstrating the interaction between the type I interferon system and other proinflammatory pathways. The observation that a single injection of an anti-IFNα antibody could give a sustained neutralization of the interferon signature is of particular interest, and supports the view that the ongoing production of interferon in lupus is at least partly a result of a self-perpetuating vicious circle  (Figure 1). No increase in serious viral infections has so far been reported among anti-IFNα-treated patients, which could be due to the fact that besides IFNα there exist several other type I interferons with strong antiviral activity . Whether these latter type I interferons are sufficient potent to protect anti-IFNα-treated lupus patients from serious complications during, for instance, a flu pandemic remains to be established, and can only be addressed in larger clinical trials. There exist other possible therapeutic targets within the type I interferon system, such as the IFNAR, the BDCA-2 antigen on pDC [14, 85] or oligodeoxyribonucleotide or oligoribonucleotide TLR antagonists . None of these agents have so far been tested in human lupus patients. In conclusion, the type I interferon system is activated in lupus patients with ongoing IFNα production, which is of major importance for the disease process. The genetic and immunological background to this overproduction of IFNα is to some extent clarified, but several questions still remain to be answered. Despite this, several studies aiming to target the increased IFNα levels or its effects in lupus patients are planned, or are in the early clinical phase. These treatment regimes will hopefully bring relief to our patients without interfering with the normal function of the type I interferon system. The present work was supported by The Alliance for Lupus Research, the Swedish Research Council, the Dana Foundation, the Swedish Rheumatism Association, the Gustafsson Foundation, the King Gustaf V 80th Birthday Foundation and COMBINE. LR has served on the advisory board for Active Biotech Research Inc., MedImmune Inc. and Novo Nordisk A/S.